Dating back to 1905, the Monroe Bay Inn was originally built by the family of telephone inventor and former summer resident of Colonial Beach, Alexander Graham Bell and it was then called the Children's Salt Air Home. Kids from Washington, D.C. who needed it were brought in for the summer on the St. John's steamer ship and had their spirits lifted by the fresh air. The fun beach atmosphere of Colonial Beach probably helped, too. 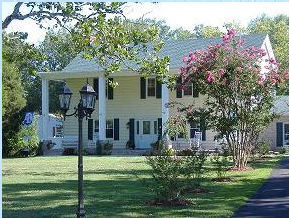 A lot of the fun stuff in town is within easy walking distance, as this B&B is located just a block from the gorgeous Monroe Bay, and three blocks from the Potomac River. This venue used to consist of five acres back in the day, and there were other structures on the property as well. The former two-story boys dormitory portion of the site is what makes up the Inn. Reportedly it was the first Bed & Breakfast in Colonial Beach, opening it's doors in 1990 and formerly known as the Quiet Water Cove! In it's current configuration, there are four beautiful bedrooms, each with private baths. The facility is open year round and there's wi-fi, too. Local artists are now showing oils, watercolors, fiber, photography and other media here. I was able to meet innkeeper Shirley Heinrichs recently and found her to be very pleasant and I enjoyed visiting with her. Book a stay at this beautiful and relaxing B&B and enjoy some time in this waterside town.